Giggles Printed Hooded Robe with Belt | Multicolour | helps to keep baby warm,cozy and dry. 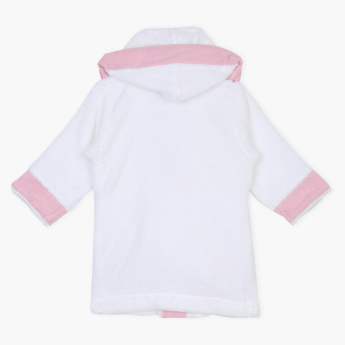 Cover your baby dry and clean in this printed hooded robe after the bath. This helps to keep your baby warm and cosy. It is water absorbent and it comes with long sleeves. Feature 2 : easy absorbant and soft to baby skin. Feature 1 : helps to keep baby warm,cozy and dry. Feature 3 : long sleeves and hooded with tie-belt at waist.